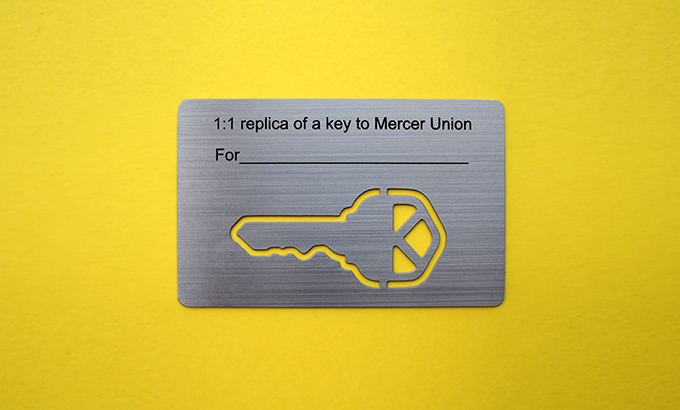 Toronto-based interdisciplinary artist Jon Sasaki has designed our 2015-16 member card edition entitled 1:1 replica of a key to Mercer Union. Please join us for the edition launch, followed by the opening reception for Mercer Union’s summer exhibitions. Artist in attendance. Jon Sasaki’s work has been exhibited in numerous solo exhibitions in galleries including the Tom Thomson Art Gallery (Owen Sound, ON); the Southern Alberta Art Gallery (Lethbridge, AB); and the Art Gallery of Ontario. Recent group exhibitions include Platform Art Spaces (Melbourne, Australia); Nihonbashi Institute of Contemporary Art (Tokyo, Japan); and the Museum of Contemporary Canadian Art (Toronto, ON). His videos have been programmed in screenings at the MCA (Sydney, Australia); the Images Festival (Toronto, ON); and Brick + Mortar Film Festival (Greenfield, MA). In fall of 2014 he completed an outdoor public installation at Sheridan College (Oakville, ON) as part of their Temporary Contemporary commissioning program. He is the recipient of the 2015 Canadian Glenfiddich Artist in Residence Prize (Dufftown, Scotland) and will participate in the Canadian Residency (Detroit, MI) in the fall of 2015. Sasaki holds a BFA from Mount Allison University (Sackville, NB) and is represented by Jessica Bradley Gallery in Toronto.